Now the search is on to figure out exactly what kind of puppy will be right for the Obamas. The AKC, the Humane Society of the United States and other animal groups are all eagerly trying to assist the family in choosing a pet. The AKC held a poll a few months ago and more than 42,000 people voted on what kind of dog they thought would be best for the Obamas. Since one of the Obama daughters has allergies, voters were given five hypoallergenic breeds from which to choose. The big winner was the Poodle, long considered an ideal family pet by many people. The Poodle is the eighth most popular breed in the country, based on 2007 registration statistics. 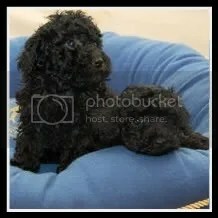 Poodles are also extremely intelligent and devoted family members with great temperaments. They’re very smart on their own and capable of learning anything you want to teach them. They do require some coat maintenance but that shouldn’t be a problem for a dog who would be living in the White House with a staff to help take care of him. Whether the Obamas will opt for a Poodle, or any purebred dog, or choose a dog from a pound or rescue, we don’t know. Michelle Obama has been reported as preferring to adopt a puppy, but with the family’s need for a dog that will be better for a child with allergies they will have to choose carefully. In that way they can set a good example for everyone since no one should obtain a dog on impulse. Not to be outdone, vice president-elect Joe Biden reportedly has permission from his wife to get a “big dog” now that he’s won the election. No word yet about what kind of dog the Bidens will be seeking. It’s nice to see our new leaders taking such an interest in getting dogs. You probably know the Harry Truman quote, “If you want a friend in Washington, get a dog.” Maybe Mr. Obama and Mr. Biden will have some friends, at least for a while. But when things get tough they will have their family dogs for friendship.